Posted on August 6, 2010	by Lou Murray, Ph.D.
First we had May Mist. Then June Gloom. Fine. We expect that here on the coast of southern California. But next we had a gray July. Now we’re into August, and it’s STILL cold and foggy. I’m not complaining about the lack of heat from the perspective of personal comfort, but without any sunshine, I’m wondering if I’ll ever get any squash. I mean, what kind of gardener am I if I can’t even grow squash?!?!? I planted plenty of squash seeds at the right time, but alas, my crops have failed. I tried two zucchini transplants in late January, a bit early in the season. I wasn’t surprised when they died without having made a squash. I planted three heirloom patty pan squash on March 8 from a mix of white, yellow, and green patty pans. One of them produced four white patty pan squash and quit. The plant isn’t quite dead yet, so I’m holding out hope for another patty pan or two. The other two plants died without offspring. I planted two each Gold Rush, Clarinette Lebanese and Early Prolific Straightneck from seed on April 17. They sprouted, made a couple of leaves, and then most of them died. One surviving Early Straightneck is now the size of my palm. I’ve never seen a tinier squash plant in my life. 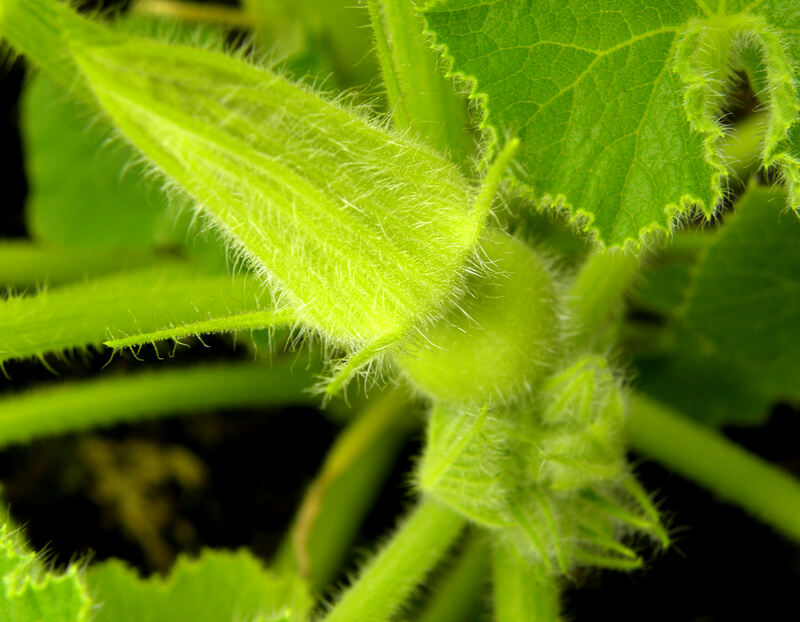 It is just now thinking about producing its first male flowers. Ditto the one surviving Clarinette. Pathetic. I’m too embarassed to even post a photo. 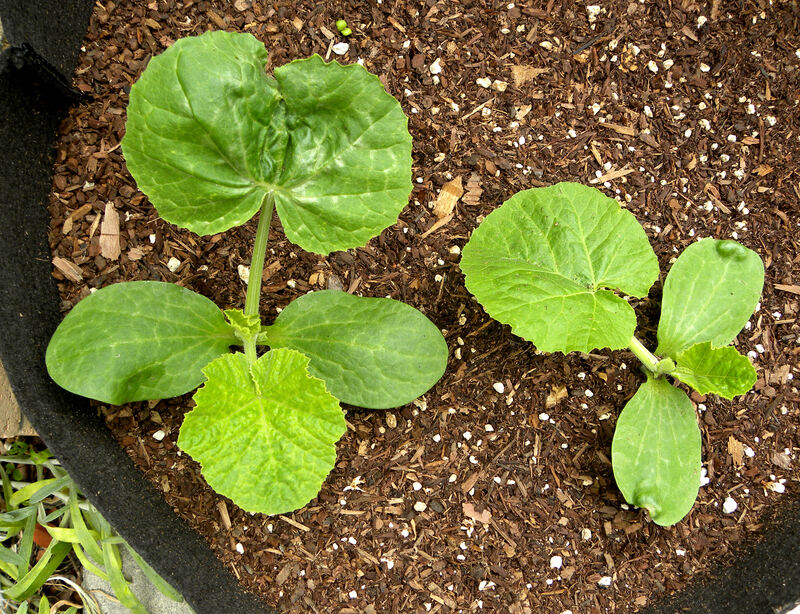 Three 2-month-old mini winter squash in a Smart Pot. I didn’t get around to planting any winter squash until June 2. I planted three seeds from a mix of mini red Kuri, mini green Kuri and mini blue Hubbard in a Smart Pot in the driveway. All three seeds sprouted and are doing well. Hurray. Halleluah, the first female flower on my winter squash! With the first female flower now getting ready to open, there is hope of getting at least one winter Kuri or mini-Hubbard. But I didn’t plant any pumpkins when I should have. I kept hoping that the Huntington Beach community garden would be up and running sometime this summer. Ha! We don’t have a lease yet from Southern California Edison, and can’t set foot on the property yet. And we still need to raise the money to pay for installation of irrigation, etc. I finally gave up on the community garden for this year’s summer crops and planted three seeds of Amish pie pumpkins in a big Smart Pot in the driveway on July 20, really late in the season. I thought that these were going to be like New England pie pumpkins, cute little things that are just big enough to make one pie. Then I read the seed packet. Ack, they’re supposed to grow to 90 lbs each. Ohmygod, I just have to hope that they really won’t do that. Our driveway isn’t big enough. I suppose starting them this late will preclude getting a pumpkin crop anyway. 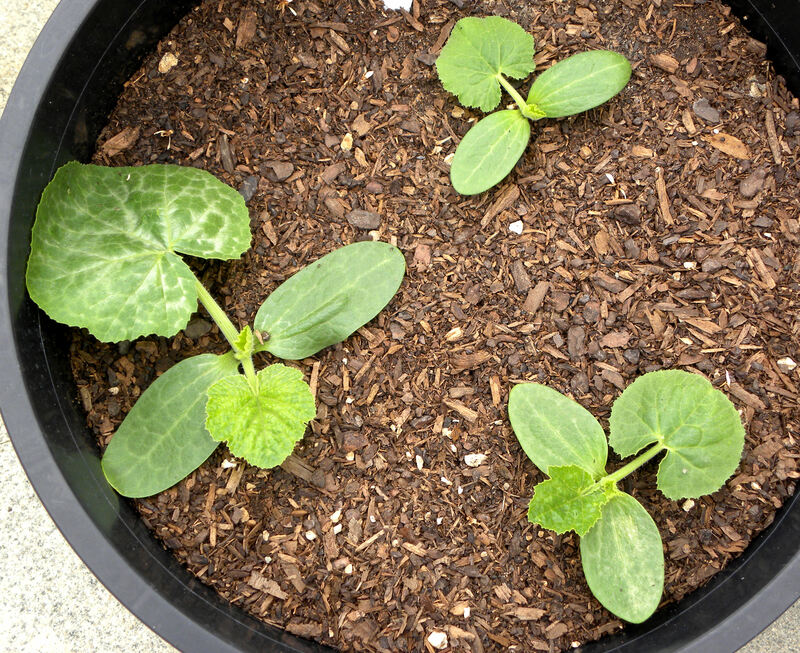 Amish pie pumpkin plants at two weeks old. So cute and little. Not having any summer squash to speak of, I’m trying once more to grow some this season. 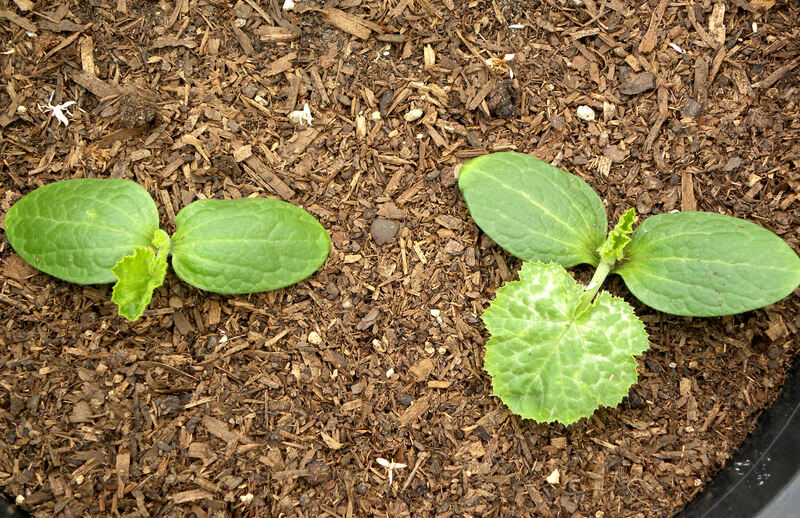 I planted seeds for Clarinette Lebanese and Gold Rush zucchini in plastic nursery pots in the driveway. Our driveway gets more sun than any other part of our yard, so I have hope of possibly getting some summer squash yet this year. Three Clarinette Lebanese planted July 21 have sprouted. Two Gold Rush zucchini planted July 21 have sprouted. It’s really late in the season to be starting summer squash from seeds. And I didn’t get those pumpkins planted in time for them to set fruit either, given normal weather. But nothing ventured, nothing gained. In these times of global weirding climate change, it seems that we can’t predict the weather. My strategy for homegrown food security is to grow as wide a variety of crops as possible, starting them at different times. I push the seasons at both ends, hoping for the best. We’re living in a climate that humans have never lived through before, with carbon dioxide levels higher than any in the past 400,000 years. Part of this “global weirding” climate change is increased intensity and frequency of storms, overall hotter temperatures (just not here this summer) and unpredictable weather. We live in interesting times. This entry was posted in Uncategorized and tagged Amish pie pumpkin, early prolific straightneck, Gold Rush zucchini, green kuri, Lebanese Clarinette, patty pan, red kuri, summer squash, vegetable garden, winter squash. Bookmark the permalink. I, too, have no squash ….so far. 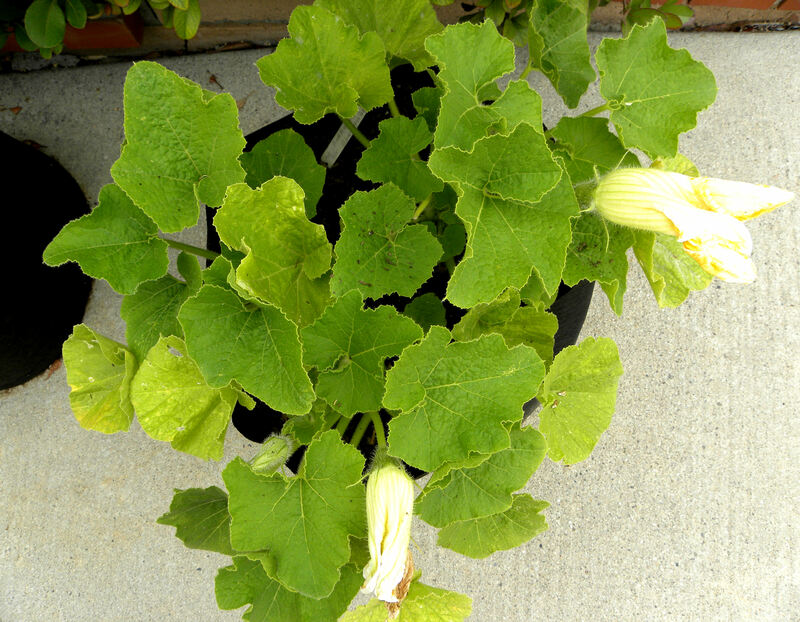 the summer squash, planted rather late, is about 18″ high, and blooming freely. However, no female flowers yet! At least it hasn’t sucumbed to mildew. This gloomy weather hasn’t slowed the Kentucky Wonder Beans down at all, nor the “cherry” tomato that was a volunteer. But the beets just can’t seem to increase in diameter past 1 1/2″. I may just harvest them and replant! Hi Kathy, Brenda K, Barbara, and Farm with a View, sounds like squash this year is feast or famine, with those of us in so Cal being on the famine end. No, I don’t know of a mini Napa cabbage, just baby bok choy. LOL!!! The 90-lb Amish pumpkins – that sounds like the sort of thing that would happen to me…. Sorry to hear about the depressing situation with your squashes. Since the crazy-cool summer we’ve been having has simply made life bearable for those of us on the other side of the concrete jungle while the garden plants are all thriving except for the ones planted in too bad of a place, my late-planted winter squash (early June) have almost all made it up to to the top of the house I built for them this year, and to my great delight, I just spotted the first little female flower on one of the kuris – I think it’s the red one, but it might be the blue. The melons are finally getting traction since they had a somewhat more disadvantaged placement in the melon/squash house. Live and learn! Just to rub it in more, I am gearing up to post a blog about what to do with too much summer squash, as my 1 zucchini plant and 1 yellow straightneck (unfortunately the poor heirloom pattypan got totally overshadowed and died), despite powdery mildew (SNAFU with installing soaker hose ) have been producing tonnages of beautiful fruit that looks nicer than anything I have seen at the farmers’ markets this summer! That said, I am betting on the cool weather this late into the year giving us a credit for hot weather through December, so I just might take a chance and plant some more icebox watermelon seeds since the seedlings I originally planted got eaten by some critter or other. You mentioned mini kuris. I didn’t realize blue/red/green kuris came in “mini” or “regular” sizes. I did mini kabochas last year and they totally buried my bonsai citrus grove. (Another blog post waiting to happen!). Would you or someone happen to know if there is such a thing as mini hakusai (napa cabbage) plants? Just stumbled across your site and so glad I did. We’re also in coastal SoCal (West LA/Santa Monica), and I think we’ve picked the wrong year to start a vegetable garden – when will this June/July/August gloom end?? I’ve added your site to our blogroll and will be checking in regularly to see how you’re doing! Like the previous commenter, I have the opposite problem – so much zucchini I don’t know what to do with it. In fact, I’ve asked myself if there might be some mutating going on there due to global warming?? LOL. I’m going to look into the other varieties you mentioned. Have you tried Hokkaido pumpkins? Hi Robin, welcome to my blog. A LITTLE warmer in Riverside? Ha. My cousin lives in Riverside and it’s HOT in those parts to my way of thinking. Good luck with your peas this time of year. Hot weather is headed our way next week. Brenda, I think that this might actually be a good time to get cauliflower, broccoli, cabbage and Brussel sprouts going in pots. I think we’re supposed to transplant them into the garden around mid to late September, so they would need to be started around now in pots as long as they’re protected from mid-day sun.